The Board Of Control For Cricket In India (BCCI) on Wednesday announced India's squad for 4th and 5th test match to be played at The Rose Bowl, Southampton on from August 30 and Kennington Oval, London from September 7. The new squad include Virat Kohli (C), Dhawan, Rahul, Prithvi Shaw, Pujara, Rahane, Rishabh Pant (wk), Hardik Pandya, Ashwin, Jadeja, Bumrah, Ishant Sharma, Shami, Umesh Yadav, Shardul Thakur, Karun Nair, Dinesh Karthik (wk), Hanuma Vihari. 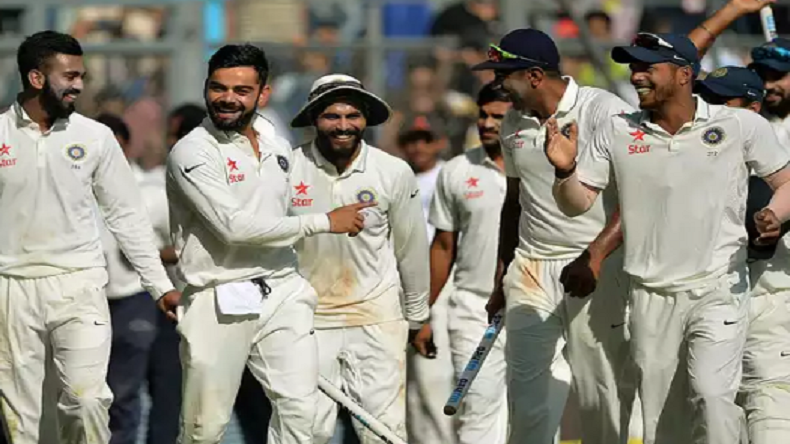 Getting back in the ongoing Test series after thrashing the England team by 203, the Indian team has announced its squad for the remaining two games. The 3rd test will be played at The Rose Bowl, Southampton while the 4th game will be held at Kennington Oval, London. The Board Of Control For Cricket In India (BCCI) announced India’s squad which include Virat Kohli (C), Dhawan, Rahul, Prithvi Shaw, Pujara, Rahane, Rishabh Pant (wk), Hardik Pandya, Ashwin, Jadeja, Bumrah, Ishant Sharma, Shami, Umesh Yadav, Shardul Thakur, Karun Nair, Dinesh Karthik (wk), Hanuma Vihari. 18-year-old Prithvi Shaw and 24-year-old Hanuma Vihari have now been included in the team for the last two games while Murali Vijay and Kuldeep Yadav have been dropped in the last two games. Already popular in the cricketing industry, 18-year-old Prithvi Shaw had led the U19 to a World Cup title earlier this year. Besides that, he previously became the youngest player to score a hundred in Duleep Trophy debut. Shaw also smashed a ton in his Ranji Trophy debut and became a successful player in the domestic cricket. India will be keeping high hopes from the 18-year-old Prithvi Shaw, who will debut in the Indian Test cricket team. Earlier in the day, India thrashed the England team to win the 3rd test in the 5-match Test series, keeping the series alive. The team had lost the first two games, therefore, it was important for Team India to win the third test and keep the series alive. India in its two innings made 329 and 352/7 declared while the England team was all out on 161 in its first innings and could not go beyond 317 in 104.5 overs, losing the match by 203 runs. However, at one point of time, England was in strong position when Jos Buttler took the lead and scored a ton, but India’s Bumrah took his wicket at 106 and gave the team its needed breakthrough. The remaining wickets did not stop falling after that. With two test matches, its hard to predict who will clinch the series title, but so far, it has been an amazing series.